Here's guide of how to free convert WebM to MP4 on Windows 10. WebM, the video format contains VP8/9 video up to full HD 1080P/4320P and Vorbis/Opus audio, is widely used for HTML5/Chromecast video and natively supported by Mozilla Firefox, Google Chrome, Opera and YouTube. Despite of achievement of WebM application in online videos, it cannot be directly played on Windows PC, Mac and almost all portable devices. In order to play WebM on computers or devices without hassle, it is necessary to convert videos from WebM to MP4, the most compatible video format with any devices, for a smooth playback. And, this article will lead you to convert WebM to MP4 on Windows 10 for free by means of the best free WebM to MP4 video converter for Windows 10. Needing of WebM to MP4 conversion urges development of video converting software, while users may involve in trouble of how to pick out a really helpful tool from a wide variety of products in market. So, how to grab the best free WebM to MP4 converter for Windows 10? 1. It requires a video converter totally compatible with Windows 10. 2. A user-friendly converter is a good choice so that you can get how to convert WebM to MP4 immediately. 3. Conversion speed and output quality are also should be included in selection criteria. 4. It is sure that you prefer a clean and safe program bundled no adware, spyware, virus or other harmful plug-ins. According to the above tips, WinX Video Converter is qualified to be the best free WebM to MP4 converter for Windows 10, which is available to free convert WebM to MP4 on Windows (10/8/7/Vista/XP) in couple of minutes due to Super Transcoding Engine and Multi-core CPU (up to 8) utility and deliver crisp images and hi-fi audios in a few clicks. Built in 300+ video/audio codec, WinX Video Converter realizes conversion among almost all mainstream SD/HD/4K/8K videos, e.g. MP4 to WebM, WebM to MP3, MKV to MP4, AVCHD to AVI, AVI to WMV, MOV to MP4 and enables to convert SD/HD/4K/8K videos to iPhone/iPad, Android/Windows devices. Download and install this free Windows 10 WebM to MP4 converter and change video formats from WebM to MP4 step-by-step. Launch WinX Video Converter on your Windows PC. Add WebM video by to tapping +Video button on navigation bar. Get PC General Video category from Ouput Profile dialogue and select MP4 (AAC/MP3) as output format. You can customize audio/video parameters (bit rate, resolution, aspect ratio, sample rate etc.) to export MP4 video perfectly fitting devices specs and edit videos by cropping, trimming or adding external (.srt) subtitles. Tap Browse button to set destination folder (hard drive or devices) and click RUN button to start WebM to MP4 conversion on Windows 10. 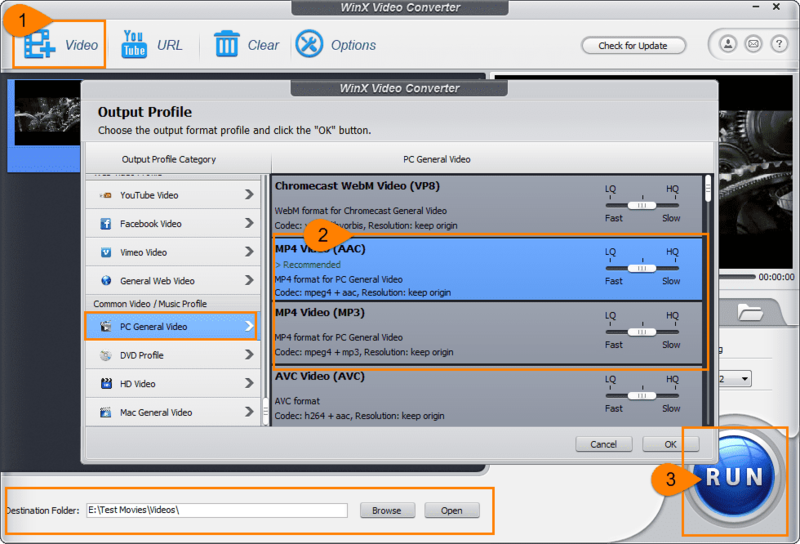 Tip: if you would like to free convert WebM to MP4 on Mac OS X 10.10 Yosemite or more, please turn to WinX Video Converter for Mac. ▪ Download and convert/compress HD/4K/8K videos to iPhone, iPad, Samsung, Google Nexus, Sony Xperia, Windows Phone, Surface Pro, PS3/4, Xbox One/360 etc, for a better video/movie playback whenever wherever. ▪ Make slideshow video from collection of albums with background music in MP4/FLV/WebM format for sharing online.